When I first started this weblog of mine, my intention was to attempt to post something new every day for at least one year. And here we are, one year later, and despite illness, despite weddings, despite floods and locusts and power outages and Blogger‘s usual shenanigans, I actually achieved that goal, and only managed to irritate one or two people along the way. Some days, especially early on, I didn’t post much – maybe just a link or two – and the one day I just wasn’t able to post and had pal Dorian fill in, I still managed to put in a brief appearance explaining why Dor was filling in. Over a year of posting, I’ve managed to knock a little dust off my HTML skills, though some lessons took a while to learn — like specifying exact dimensions for images so that the permalinks don’t cause the page to jump all over the place as the images load. Er, sorry about that. Also, I had to find out about “hotlinking” — I never did it, but plenty of people did it to me until I learned how to block that sort of behavior. The thought did occur to me to replace hotlinked images with something appalling, like some sites do…but decided against it because 1) I’m a nice guy, and 2) it sounded like that would be hard work. Well, the origin of the name, anyway. The first half of the name is easy…I’m named after my dad. I’m Mike Sterling Jr., he’s Mike Sterling Sr. Now why my grandparents decided to name my dad “Mike” remains a mystery. The second half requires a little more backstory. 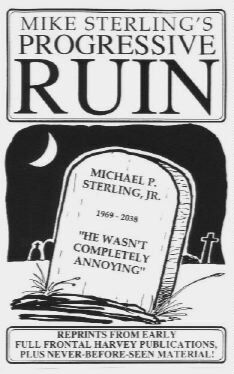 For about a five year span in the mid-90s, I was involved in a local mini-comics publishing concern started by my old friend Rob. The “company,” named Full Frontal Harvey (after an offhand comment from an MTV veejay regarding Harvey Keitel’s performance in Bad Lieutenant ), published about three dozen different digest and mini-sized publications. The flagship title was an anthology book entitled Wood-Eye , and contained work by Rob and myself in all twelve issues, and also had plenty of work by future Xeric Grant winner Fred Noland…not to mention one cover by Love & Rocket ‘s Jaime Hernandez (posted on this very site yesterday), a couple cartoons by novelist Scott Phillips, and the occasional cartoon by this weirdo. 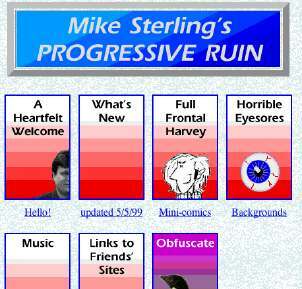 My original website, which I refer to as “Progressive Ruin 1.0,” was first put on the web on November 8, 1996, and was basically there to, well, fill up some of the 5 megabytes of free web space offered by my ISP of the time. It was also the Official Website of Full Frontal Harvey, featuring cover scans of all our books, a downloadable mini-comic, and other goodies. Yes, the origin of my website’s name is that it’s from a previous website. It’s a cop out, I know, but it’s still better than the ending to What Dreams May Come . “But what does it mean,” you ask? Well, it’s a reference to the fact that…um, well, I’m going to grow older, my body is going to weaken, my cognitive faculties will dull, and I’m eventually going to die…and as such, any record of my actions and experiences, such as through a collection of comic strips I’ve drawn, or posts on a weblog, can be seen as a document of that steady decline. Or, if you will, of my progressing ruin. See? A laugh riot, no? Oh, relax, I’m not chronically depressed or anything…I just thought it was an amusing title, an ironic counterpoint to the hopefully humorous offerings both in my old comic strips and here on my weblog. Besides, I plan on living forever, so I don’t really have to worry about any of that aging or declining health stuff. I’ve done some online comics discussion in the past. In the local BBS community (remember those, way back in the pre-internet days? ), I was the go-to guy to run comic book message groups on various boards. I think I in charge of about four or five, as I recall, including a message board on a BBS run by this fella. And in the early days of AOL, I would occasionally pop in on the comic boards there, though the level of discourse was…um, not exactly quality, shall we say. I never participated in the Usenet thing, like a handful of my weblogging brethren (and sisteren) did. So, after the fall of the BBS scene, aside from talking with some of my friends or the occasional discussion at the comic shop, my comics talk was at a minimum. I didn’t (and still don’t) try to use my position at the store to excessively inflict my comic book opinions on hapless customers…I really try hard to not be one of those guys, you know? And that’s why I’m glad I now have a weblog. I can talk at length about all the funnybooks I want, without having to worry about preaching to a captive audience (like I could do at the store, were I one of those guys), and without having to bore my audience to tears (presumably, if you’re reading this site…in particular, if you’re still slogging through this post…you must have at least a passing interest in comic books). And to think, when I started, I didn’t plan on making this weblog comics-only! Oh dear, oh dear. I was insufferable even way back then, wasn’t I? I was very obviously trying to be “funny,” and failing miserably at it. Plus, God may never forgive me for my slight against the late Mr. Swan. It’s also one of those “recap the plot” kind of letters, which I hate. Even being 12 years old at the time is no excuse. At any rate, I’m sure they printed this letter more because it fit the space available rather than because of any perceived quality. If only they’d followed my advice to keep Cary Bates, though…. Please note that the city I lived in at the time was Port Hueneme, though whoever typeset this letter accidentally appended the state abbreviation of the end of the city’s name, making it “Huenemeca.” Thus, I was able to track all the mail I received as a result of having my letter printed in this comic. Fan club offers, conventions flyers, catalogs…all addressed to “Port Huenemeca.” Okay, it wasn’t that much mail, but it was neat to see what a 12-year-old kid could get just for having a letter pop up in a comic book. 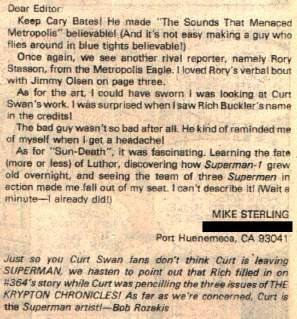 I only ever wrote one other letter of comment, in reference to DC Comics Presents #50, which was never printed. Though, looking at the letter that did get printed, it’s probably just as well. There’s only so much public humiliation one person can stand! One of the unexpected results of this weblog was getting to interact to some extent with professional comic creators, including Tony Isabella (whose Hawkman comics still remain some of my favorite featuring that character), Fred Hembeck (whose cartoon overviews of bizarre comics of the past is a definite inspiration of mine), and Scott Saavedra (whose mighty Comic Book Heaven magazine celebrated the goofiness of comics in a way that my little website can only try to imitate). Another result I really wasn’t anticipating was cartoonists, writers, and publishers sending me items for review. The first I received were the volumes 1 & 2 of the amusing children’s series Sidekicks by Tom Mason and Dan Danko. Items from Ait/Planetlar‘s Larry Young, cartoonist Steve Lieber, and Atomeka Press were to follow. It’s all part of their marketing strategies, I realize, but it still makes me feel pretty good to think that my opinion on their releases is desired, and that my little venue here is important enough to warrant being sent review copies at their not-inconsiderable expense. Well, I had this game when I was a kid. (You can read more about the game, and see some pictures, here.) And, when Rob, Fred, and I went to the second Alternative Press Expo in San Jose, CA (in ’94, I think) to shill our Wood-Eye comic, I got my chance to meet Scott Saavedra and tell him in person about the game and how it was played. He was appalled, as any decent human being would be, and from that point on I was “the guy who had the Titanic board game.” Well, I don’t think Mr. Saavedra ever referred to me as such, but I’d mention it on occasion to remind him who I was, like when I’d order copies of his original self-published version of Comic Book Heaven , and he was nice enough not to tell me I was annoying him. Okay, it’s not much of a story, but it gives me an excuse to once again plug Scott Saavedra’s weblog which you should visit immediately after you’re done here. You should also buy the Dr. Radium trades and the Comic Book Heaven digests and collection as well. Thanks to Rory, who was the first person I knew in real life to put a link to my weblog on her website (Baresark), and to Bill Sherman, who was the first person I didn’t know to link me on his own site (Pop Culture Gadabout). Thanks to pal Andy, who has been kind enough to link me on his essential Waxy.org a handful of times…which directly led to me being linked by Boing Boing, giving me my largest single day’s worth of traffic thus far (just shy of 7,000 unique visits). Thanks of course to everyone else who has posted links to my site as well. Thanks to my pals Dorian, Corey, Sean, Tom, and Ian, the mighty Associated Comics And Pop Culture Webloggers of Ventura County, CA And Outlying Environs…more is definitely the merrier. Extra thanks to Ian, whose mentions of me on the Comics Journal message boards must certainly have brought me to the attention of Dirk Deppey…which brings me to thanking Dirk, for his many kind mentions of my site on the sadly missed web version of Journalista. This post in particular, the last before his farewell message, still brings me visitors all these months later. Thanks to all my fellow comics webloggers, who have made a fun hobby even more fun. Thanks to the customers from our store who read my site, but still shop with us anyway. Thanks to my girlfriend Nora, whose tolerance levels are apparently higher than any normal human’s, as she’s put up with my silly comics stuff for what I’m sure she thinks is much too long. Thanks to my dad, who reads my site every day, even though I’m sure he doesn’t know what the heck I’m talking about half the time, what with some of the comics minutiae I get into. I don’t even know what I’m talking about half the time. And thanks to my mom, for…well, you should always be thankful to your mom, you know? 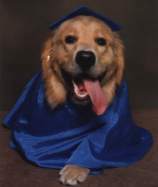 And thanks to you, the readers, who have decided that my goofy ramblings are of enough value to keep you coming back. Your readership, and your comments, are always much appreciated. …oops, sorry, just slipped out.